and scroll down the right side bar to LABELS- ELEMENTS and click on Solar In New Mexico for the same list of posts on solar. We have built and lived with three sun spaces in the last 20 years in two houses and now own a fixer upper we recently bought with a 6' x 80' sun space. In much of the world it is a no brainer. But you don't need a sun space to dry your clothes, all you need is a clothes line outside (although we do use both the clothes line and the sun space). The first thing I did in our new house was to take out the dryer. This is a great topic, thanks for bringing it up. I hope to blog on this much more in the future. I mentioned the laundry in the sunspace because for a lot of people in northern climates, its pretty challenging to hang laundry outside in the winter -- also gets around picky Home Associations. Will keep an eye on your blog for more. 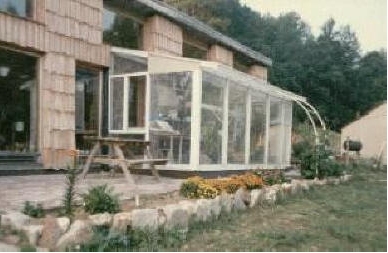 Hi -- Like the idea of adjustable awnings -- especially for east facing windows where the sun can come in low in the summer. I do have a sunroom attached to my house. It is used to dry laundry all year long if it cant be hung outside. Here in Canada winters are cold, so I use this to heat the house, I have a fans that blows cold air from the basement into the sunroom, as another fan blows hot air into another section of the basement. On sunny winter days, it heats my house all day long. Sounds good -- any chance of getting some pictures? Just a note that clothes washed in a front-loading washer come out almost completely dry already so... especially in a dry house in the winter... they will dry quickly anywhere they are hung. are there more details on the photo at the end of this post?? 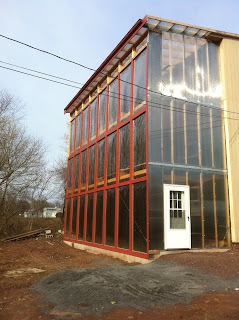 Hi -- That is Nick's most impressive sunspace that also uses the "deep mesh" absorber to increase efficiency. I'm hoping to get Nick to provide more info on it. I have a few more pictures Nick sent, but it really needs the description, and I don't understand it all well enough to do it myself. Sunspaces are fine for what they are... don't forget that they actually block passive radiant solar energy from directly entering your house. So if you are designing a new home, use direct gain passive solar methods which work much better than a sunspace. There have been a lot of studies that back this up, but of course I can't find one right now. A sunspace is a lousy solar collector because it gets cold every night. So then you have to wait a long time the next day before it's hot enough to send heat into the house, assuming you have s good fan system or passive method for that. They are also lousy living spaces because no one likes to spend time in a place that is always too hot or too cold. So you are spending money to build a room that you can't really use except to grow things (which is fine but costly). In the worst case you might even be heating it just to keep those plants alive. Hey Kevin -- Guess we have to agree to disagree on this one, but if you run across those studies I'd like to get the links. The low thermal mass sunspaces as described in the Shurcliff article listed above have little mass and heat quickly, and it seems like the reduction in heat loss from large windows directly in the south wall make up for the more indirect heating. Agree that there is going to be a lot of the time when the temperature is not right for being in, but during the times when the temperature is good, its a great place to spend time with the more outdoor feel and lots of sun, and the cost per sqft can be low. All pluses and minuses to weigh, but if I were doing a new house (which we are thinking about), it would have a sunspace as a key part of its solar design. We have a new article coming up in Home Power that goes into low thermal mass sunspaces vs sunspaces with mass, and with some good descriptions of actual sunspaces from Mike, Bill, and Nick.